I’m of the belief that every person has that one food that they make best. My mom makes cookies to perfection. Me? I’m a soup girl. I love how soup comes together. It always surprises me a little bit.Soup is not glamourous. It’s not showy. It just is. Just a little bit of this and a little bit of that. Things not quite pretty enough for something else. Some spices and flavorings. A good long simmer on a cold, winter afternoon. And then… it hits you. There is just something about the smell of soup cooking low and slow on the stove while my family is busy with the day. It makes me want to cuddle up under a blanket in my favorite chair. To fill up a soup mug with this delicious soup mug cozy and take a very long, deep breath. And suddenly all is right with the world. And it is good. Worsted weight yarn. I used Lily Cotton leftovers in yellow. Finished size: About 16″ long by 2-3/4″ tall. Fits circumference 13-14″ soup mug. R7: Sl st in the first 2 st, ch 1, sc in the same st, sc in the next 4 st. (5 st) Leave remaining unworked. R11: ch 1, turn. Sc in first 2 st, ch 1, skip 1 stitches, sc in last 2 stitches. R13: ch 1, turn. Sc in ea st. Do not fasten off. Rotate work to work edging. Edging: continue to work sc around edge of cozy. In corner stitches work 2 st for a rounded edge or 3 st for a more squared off edge. Slip stitch to first stitch in row 14 and finish off. Weave in edges. Position on mug to determine best placement for button. Sew on button. Love this pattern and want to see more? Sign up for my weekly newsletter so you won’t miss a thing! I love seeing your finished projects! 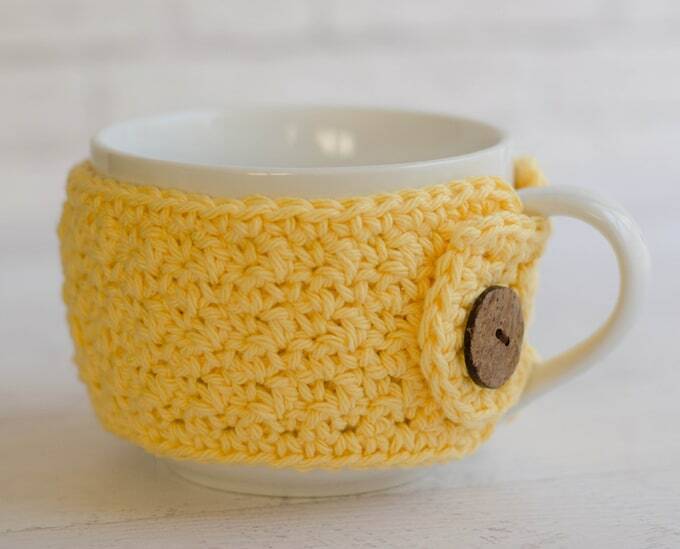 If you share your Lemon Peel Soup Mug Cozy on Instagram, be sure to tag me @crochet365knittoo. If you are on Facebook, stop over to the Crochet 365 Knit Too Facebook page and share a photo! I’d love to see your work! Written pattern copyright Cheryl Bennett 2018, all rights reserved. Please do not reprint or repost this pattern. 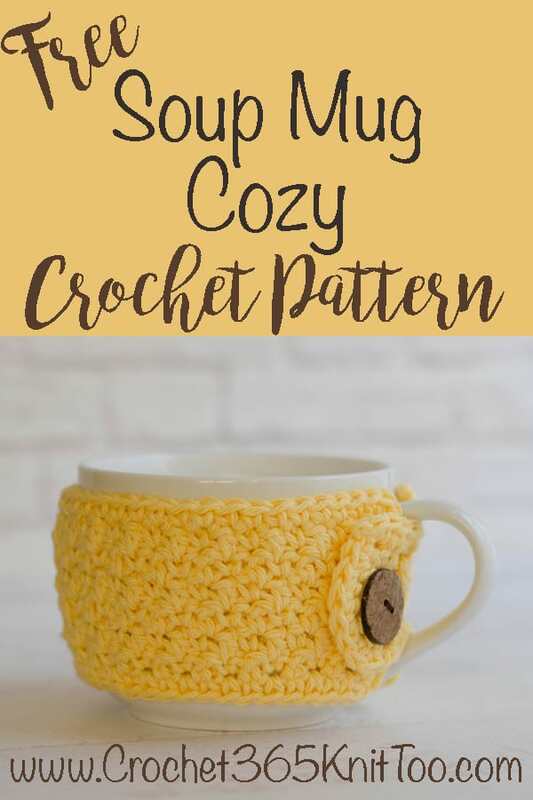 If you would like to share this Lemon Peel Soup Mug Cozy pattern with others, just link to this page. If you’d like to make items for sale from this pattern, please visit my About page for more information.